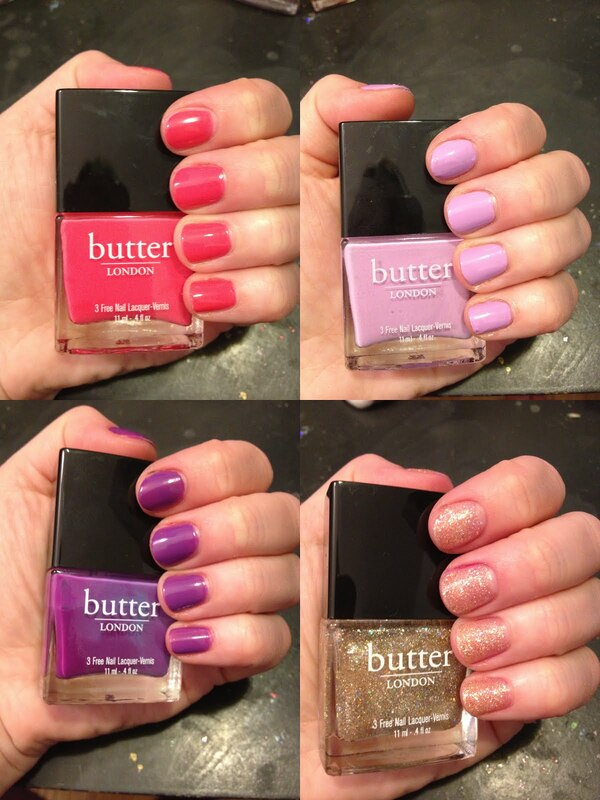 I've told you before how much I love butter LONDON. Well, I have four more colors to show you! Check out swatches and all the fabulousness after the jump. Tart With A Heart is definitely my favorite of the bunch. Look at that glittery stunner! This polish is has a base of gold glitter with some holographic and pink sparkles mixed in. I definitely think it pulls more gold than anything else, though. Two coats aren't enough to completely cover the nail, as you can see above. But I like that this color is flashy yet still somehow neutral enough to be worn on a normal workday. Brummie is a deep violet creme. My bottle had a little murkiness to it, even after rolling and shaking, so the first layer came out more lilac than violet. But by the second coat, it seemed to even out. I wonder if the color would be even deeper and less patchy if the bottle didn't have the weird rolling colors within the formula. I like this color, but it applied a bit too matte for my tastes. Cake-Hole is an eye-searingly bright neon pink creme. One coat makes it look matte, but two create a super glossy, opaque finish. This is definitely a great summer color for either tips or toes. Molly Coddled is a pretty pale lavender creme. This one definitely leaned a lot pinker on me than purple, and I'm not a huge fan of how it looks against my skin tone, but it's pretty. It would be nice for a spring wedding. The formula was definitely on the thicker side, so I recommend two very thin coats. They're nice set but I'm not exactly fond of them. What I love are the Butter London Holiday 2012 collection especially Jack The Lad. It's dark evergreen base with yellow-gold, aqua-blue, and grassy green foil shimmer. Very gorgeous! I love Tart With A Heart and Cake-Hole! I've bought a couple last weekend for myself and as a gift to my little sister. They're absolutely gorgeous!